If you run a small business, you will know that keeping track of your small business cash flow is very important. It can be difficult to keep tabs on everything you spend, but it’s important for the success of any business, big or small, that you do. Any expenditure that’s not recorded could throw the balance of your budget. This cash flow template will help you to keep track of your business expenditure. Using the cash flow template couldn’t be easier as you can download it for free and use Microsoft Excel to keep track of your small business cash flow. It’s easy to download and simple to use with Excel. The cash flow projection template has a wide array of headings all divided up into Excel cells and columns. You can input your business information into the spaces provided to keep careful track of your business expenditures. There is a section for inputting the financial details from your receipts, so that you can easily keep track of your small business cash flow. There are headings for all the possible receipts you can receive as a small business owner. In addition to this, there is a section in which you can record what cash you have paid out. There are headings included for all the different expenditure requirements you might have. 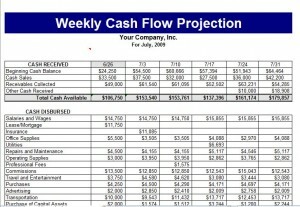 The great thing is that the cash flow projection template is fully customizable to suit your business needs. You can change whatever you want in Excel. Make sure you keep all your business related receipts together in one place – this will make inputting your data much easier. Make use of the ability of Microsoft Excel to calculate totals. The cash flow template allows you to enter data relating to different time frames. Keep your business data organized, so that you can input it in chronological order. The cash flow template includes a line chart that tracks your cash flow. You can use this to get an overview of your cash flow situation.